and Z: Zombie Stories, edited by J. M. Lassen. It also appeared as Episode 94 of the Pseudopod podcast. The illustration is by Jandan. Learn more about the story here. It was past midnight, and Jack and Dustin were driving along a twisted path through the woods. Jack was at the wheel. He was arguing with Dustin over Ashley. Jack had always thought she had a pretty face–thin, arching eyebrows, a slightly upturned nose, a delicate chin. She’d dated Dustin in college for six months, until he got possessive and she got restless. Now, Jack thought, maybe she was interested in him. “Not according to her,” Jack said, with a pointed look. He turned his eyes back to the road, and in the light of the high beams he saw a man stumble into the path of the car. Without thinking, Jack swerved. The car bounced violently, and then its left front side smashed into a tree. The steering column surged forward, like an ocean wave, and crushed Jack’s stomach. Dustin wasn’t wearing a seatbelt. He flew face-first through the windshield, rolled across the hood, and tumbled off onto the ground. A man was pounding on the side of the car, just beyond the driver’s side window, which was cracked and foggy and opaque. Jack pushed at the door, which creaked open just enough for him to make out the man’s face. The man stared at Jack, then turned and started to walk off. But the man didn’t respond. He wandered toward the woods. “Hey!” Jack screamed. He brushed aside a blanket of shattered glass and released his seatbelt. He pushed his seat backward, slowly extricating his bleeding stomach from the steering column, then dragged himself out the door and onto the ground, and he crawled after the man, who continued to walk away. The man gave a long and wordless moan. Jack stared at him. The man was very pale, with disheveled hair. His face was encrusted with dirt, and his teeth were twisted and rotten. His eyes were… oozing. Jack turned. Dustin stood there, his nose and cheeks torn away. Two giant white eyeballs filled the sockets of his freakishly visible skull. Scraps of flesh hung from his jaw. Jack screamed. Dustin stumbled over to the wrecked car, to where one of its side-view mirrors hung loosely. He tore off the mirror and stared into it. For a long time, he neither moved nor spoke. Jack shuddered and backed away from the man. Dustin’s eyeballs fixed on Jack’s stomach. Apprehensive, Jack looked down. He lifted his blood-drenched shirt to expose the mangled mess beneath. “And so are you,” Dustin said. The dead man who had caused the accident was following them. He stumbled from the trees and regarded Jack vacantly. The man paused a moment, as if trying to focus, then gave another inarticulate groan. He wandered away. “Are there others like us?” Jack said. The warm and fetid air carried back only wails. Dustin shrugged. He and Jack followed the road until they came to a small house with its lights on. But he followed Jack toward the house, whose front door was open wide. They paused on the porch. They could see into the kitchen, where a woman stood clenching a baseball bat. A dead boy had backed her into a corner, and he shambled across the yellow linoleum toward her. Dry dirt tumbled from his sleeves and fell in a winding trail behind him. Jack started forward, but Dustin held out an arm to stop him. “Stop it!” the woman shrieked, but her arms shuddered and she collapsed, sobbing. The boy fell upon her. He clawed at her hair, and she thrashed. He tore at her scalp with his teeth. Jack cringed and turned away. The woman screamed, then gurgled, then was silent. When Jack looked again, he saw that Dustin was regarding the gruesome scene with fascination. “We’re dead now,” Dustin said. “We help the dead, not them.” He gestured at the woman. “You–” Jack stopped as the woman rose, her head a cracked and bloody mess. She stepped clumsily forward. Jack strode into the kitchen, eased around the woman, the boy, and the blood-splattered floor, and stepped toward the phone. Jack paused a moment, then began to dial. Dustin turned and stepped out into the night. The phone rang once, and instantly someone answered. “Jack?” It was his father’s voice. “I’m coming home,” Jack said. “I… can’t stay on the line.” He hung up. Jack circled the house, to where a car was parked. He took the car, and drove north for an hour, along Interstate 95, toward Waterville. He stared at his reflection in the rearview mirror. His face was jaundiced, discolored and sickly, but if he covered his gaping stomach then in dim light he might pass for living. He pulled up in front of his house and got out of the car. In the front yard lay a dead man whose forehead had a bullet through it. Jack shuddered, and circled around back. The old wood steps creaked as he stepped onto the back porch and knocked. He hung back in the shadows. A curtain was drawn aside, and faces peered out. The door opened, and Jack’s father stood there, clutching a rifle. He stared, then gasped and dropped back, raising the gun. Jack cowered and said quickly, “Dad. Listen. Please. I’m not like the others.” The rifle was now aimed straight at Jack’s forehead, and Jack stared into the depths of its barrel. Then the barrel slowly sank, as his father lowered the gun. Jack stepped into the house. His father chained him to the rusty pipe that ran out of the side of the garage and into the ground, and said, “I’m sorry. It’s only for the night. It’s the only way they’ll let you stay here.” Nine people were holed up in the house–Jack’s father had taken in some vacationers. His father went back inside. The moon was bright, and the garage cast a thick black shadow over Jack. All across the neighborhood, dogs were barking. The night seemed to go on forever, and Jack never slept. He supposed that he would never sleep again. Several large groups arrived. Jack stayed out of sight, and most of the visitors departed, headed south. Those who stayed would sometimes let Jack inside, but they kept their distance from him, and always had weapons ready. During the day the men went out, scavenging for food and ammunition, and at night they told stories of the dead men they’d destroyed. Then they would glance at Jack and fall silent. He was chained up each night, weeks of that. One day at dusk, Jack was sitting on a sofa in the living room when gunshots crackled outside. The residents brandished their weapons and took up positions by the windows. Jack’s father, rifle at the ready, leapt forward and threw open the door. Two tall men in hunting gear rushed into the house, each of them carrying several guns. Jack’s father slammed the door behind them. Then the newcomer spotted Jack and lurched wildly, falling back against the front wall and violently cocking a shotgun. The man screamed, “They’re in the house!,” and raised his weapon. The gun’s barrel wove in tight circles as the newcomer sought a clear shot. The newcomer was named Sam, and his companion was Todd. Sam was bigger and louder, and leader of the two. After things had settled down, Todd explained, “We joined up with a militia to hold Portland. But the dead, they…” He stopped and stared at the floor. Todd shrugged and tossed the note out onto the table. Jack scooped up the note and opened it. It was from Ashley, letting him know that she was all right and that he should join her if he wasn’t safe. She gave the address where she was. Jack stuck the note into his pocket. Sam’s voice was shaky: “South of here there’s this dead kid with no face. People call him the skull-faced boy. He’s smart, he can talk, like that one there.” Sam nodded at Jack. Jack realized that he’d said something wrong. Jack was chained up again. Then he crouched there in the shadow of the garage and listened to the voices that drifted out through the bright cracks in the boarded-up windows. After that the voices fell to a low, incomprehensible murmur. Jack waited for hours. Then he watched as the back door swung open. A shadowy figure with a gun crept across the yard toward him. Was it Sam? Or Todd? Or one of the others? In the darkness, Jack couldn’t tell. “I’m sorry too,” Jack whispered, rising to his feet. He hugged his father, then escaped into the night. Jack found Dustin’s army standing in a great field north of Portland. The thousands of dead milled about in loose formations and watched Jack with their empty eyes. Their groans filled the night. Jack stopped and turned. A balding dead man in olive fatigues was approaching. The man led Jack through the crowds, up to a low hill where a small crowd of dead men conversed in hushed tones. Dustin stood at the peak of the hill, and his back was turned. Standing like that he seemed normal, familiar. “We’ll be headed that way,” Dustin continued. “North. Along 95, toward Waterville… Your hometown.” He waited for a reaction. “Please help me,” Dustin shouted. “Please… help me…” they wailed. Jack stared at the lines of moaning dead. They stretched as far as he could see. Jack wondered: Why did I do it? Why betray Ashley? To protect his father, yes, but… the truth–he wanted to see her again. Would she accept him, if they were the same? If she were dead too? Some of the dumb, moaning ones wandered past, and Jack imagined them ripping at Ashley’s soft forehead with their teeth. Dustin had a dozen officers–dead men armed with rifles and pistols–who stayed close by his side. Dustin himself carried a shotgun, and kept a combat knife tucked in his boot. Jack followed along behind them, and held his rifle limply, and stared down at the damp pine needles that passed beneath his feet. He was full of foreboding. Dustin turned and studied him, then nodded. The house was a sprawling Victorian that sat in the middle of a grove of white cedars. Dustin led the squad forward. They all crouched low and scurried across the lawn in a tight column, their weapons held ready. Jack and Dustin hurried up the front steps while the others ducked behind the porch railing or dropped into the long grass. After a few moments, he heard the bolt snap out of place. The door opened a crack. Dustin rammed the barrel of his shotgun into the opening and pulled the trigger. Blood exploded through the gap, splattering crimson across the porch, then Dustin kicked open the door. The officers sprang up, firearms bristling, and charged into the house. Gunfire rang out all around. Jack was swept along into the foyer, which was already littered with bodies. A staircase led up to the second floor. Jack aimed his gun up toward the second floor landing. The other officers poured off into the side rooms, and sounds of violence shook the house. Suddenly a doorway under the stairs flew open. Jack swung his rifle to cover it, but then a muzzle flashed and a bullet caught him in the chest, and he stumbled back against a small table and knocked over a lamp, which shattered on the floor. Three of the officers stormed down the basement steps. Beneath Jack’s feet the floorboards rattled, and horrible screams filtered up from below. Jack stuck a finger into his chest and rooted out the bullet. Jack watched, horrified, as crowds of moaning dead men stumbled in through the door and began to gorge on the newly fallen corpses. Jack cast one last grim look at the feeding dead, then followed Dustin through several doorways and into a study. Ashley lay in an overstuffed chair, flanked by officers. Her pretty face was still. A trickle of blood flowed from a single bullet hole in the center of her chest. The officers herded Jack from the room. He paced down a long, lonely hallway, then out the front door and into the yard, where he sat, leaning back against a tall white cedar and waiting for Ashley to appear. Finally she did, framed in the light of the doorway. Her figure was slender, her hair long and lustrous. But her beautiful face had been carved away, until there was nothing left but eyeballs and bone. Dustin came and stood beside her, and their twin skull faces regarded each other. “I want to talk to her,” Jack said. 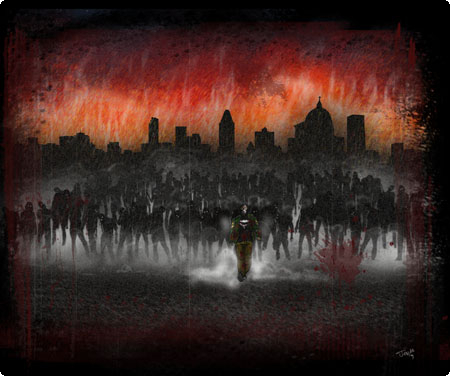 For hours Jack wandered aimlessly among the dead, among the masses of rotting flesh. Their awfulness, their stupidity, was overwhelming, and made him want to gag. Then, through the clusters of corpses, he caught a glimpse of white skull. He walked away. He wound a path through the dead, and sneaked an occasional backward glance. The skull was there. It gained on him. Then she was suspicious. “Did you have anything to do with this? Did you help him do this? Jack turned away and stumbled off into the hordes. In that moment he envied them–their lack of thought, of remorse. He couldn’t bear to confront Ashley. Now there was only one thing he could do, that might deceive her, that might make her leave him alone.